The Webcomic Beacon's 5th Anniversary Is NOW! Celebrate With Us! The Webcomic Beacon’s 5th Anniversary Is NOW! Celebrate With Us Through The New Year! SEVERAL PRIZES STILL AVAILABLE! ENTER TODAY! The Webcomic Beacon started in December of 2007, and we’ll be celebrating the 5th Anniversary starting now, through the end of the year! I’m not really sure what to really do for a BIG show (just yet), but I am totally going to be giving prizes away! 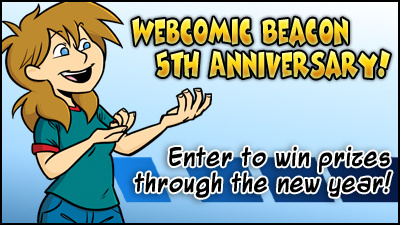 Stay tuned to this post and @WebcomicBeacon for future updates on chances to WIN PRIZES! For some, you will need to LISTEN TO CERTAIN EPISODES (they will be marked) for a PRIZE KEYWORD to email to WebcomicBeacon@gmail.com to enter and win the mentioned prize! I’ll mention in the blog posts what prize is up for grabs. PLUS choice of character bust sketch, drawn by Yamino or Chloé. and Innocent (vol 1). Writer, Shawn Granger’s complete printed works. Graphic Novel, Written by C. Spike Trotman, Art by Diana Nock. Fes Works, or Announcer Witchiebunny, or Michael Corley! Potentially more prizes will be added. Each prize is a different drawing, even if multiple prizes are listed in a single episode. Each prize entry/email can be in the same email, as long as the PRIZE KEYWORDS are all included. Deadlines for each prize (for entry) will be listed each time a prize is announced. … It is possible some prizes will require 18+ verification.³ If you don’t want to do that, don’t enter that drawing. Drawings may be extended or expanded, in which early entries become double chances. Void where prohibited. We will comply will all legalities, and modify the giveaways where needed. *Completely random, and content is subject to what each announcer would be comfortable speaking. ¹Advertisement must meet WCBN sponsorship qualifications. ²Choice of comic for review must be supplied, easily/affordably obtained, or be something we already have. Must meet First Issue qualifications for review. Submit your own comic for review at your own risk only. ³Will require 18+ verification via submitted scan of State/Government ID. License #, bar-codes, and address can be blurred. Do not enter if you don’t want to do this. AND WILL ONLY BE USED FOR THESE GIVEAWAYS!